Myth confirmed: a small rogue cannonball can cause a lot of property damage. 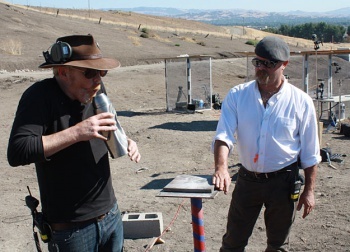 The Mythbusters have done a lot in the name of creative television. Adam Savage, Jamie Hyneman, and their crew have fought sharks, blown up cement trucks, and even built enormous solar death rays, all in the name of science. However, any good scientist knows that experiments sometimes go awry, and the Mythbusters team proved that with typically explosive results. While testing a myth involving water barrels and a concrete barrier, the team accidentally fired a cannonball into suburban Dublin, California, wrecking a roof, a wall, and a car - but thankfully, no people. In a scene straight out of a Bugs Bunny cartoon, "the 6-inch projectile bounced in front of a home ... ripped through the front door, raced up the stairs and blasted through a bedroom," according to the San Francisco Chronicle. The cannonball failed to wake the three people sleeping in the house, but the resulting plaster dust did shortly afterwards. In addition to taking out a good chunk of wall and roof tiles, the cannonball then careened across the street and smashed into a parked car. Longtime viewers will not be surprised to learn that the team has used this particular cannon over fifty times before, but may not know that this is the very first time it misfired. "They're very sorry that this happened," said a Mythbusters consultant, adding that "[They] have insurance for these kinds of things." The kind of insurance necessary to fix all of the property damage, deal with any legal violations, and keep the show on the air must be astronomical. Then again, when your show is almost guaranteed to end with a huge explosion each week, you probably invest in a pretty comprehensive policy. The Mythbusters have always been careful to balance dangerous experiments with sensible safety precautions, but if you work with hazardous equipment over and over, something is bound to go wrong eventually. Given their otherwise-stellar reputation for keeping crewmembers and civilians safe, it's probably best to write this one off as a fluke. Besides, you can't expect to advance the cause of science without blowing up a whole lot of stuff.